“We are very grateful to United Help Ukraine for its help in this difficult time for our country. 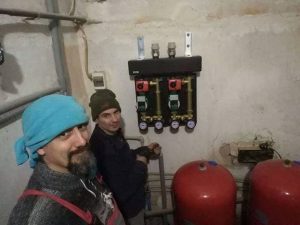 For two years now we had no heating in our church, which is located near the front line in the Donetsk region. We did not have the means necessary to buy such an expensive and modern equipment. Here, in the place near the war zone, we serve different groups of people, but most importantly, we serve children of all ages. That’s why we had to find a way to heat the church, and now the problem is solved and it’s warm here. This entry was posted in Fund Raising, Humanitarian Aid and tagged Charity, children, fundraising, kids. Bookmark the permalink.